CAD-CUT Heat Transfer Adhesive is a heat-activated adhesive which is cut on any plotter/cutter, weeded and applied to a garment before adding a heat transfer foil finish to achieve a high-street fashion metallic finish to garments in low quantities. Garment heat transfer foils are traditionally known for being short-term embellishments when added to CLC transfer papers and plastisol inks, but this heat transfer foil adhesive solves that problem by permanently bonding to the foil producing a finish that lasts as long as the garment – Use with our heat transfer foils to create stunning finishes. 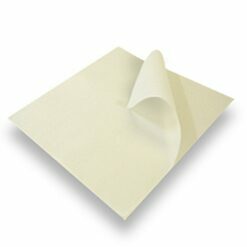 Available by the roll which is 300mm wide (11.8″) (the same width as most foils) by 9.1m in length. Cuts easily using any vinyl plotter/cutter with a standard blade. 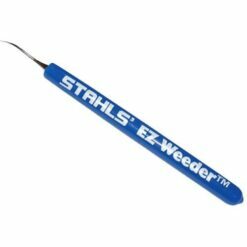 Pressure-sensitive, mild-tack (sticky), mylar carrier allows easy weeding and producing fine detail. Clear mylar carrier allows ease of placement onto the garment. 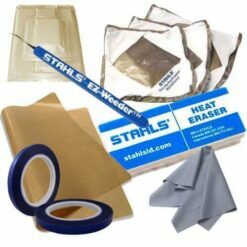 Bonds heat transfer foils to fabrics.